This is a plan of property lying between a churchyard and Basinghall Street. It features a parlour, a counting house and a warehouse with a skylight. 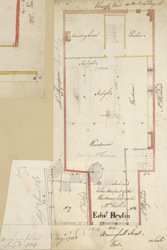 The names of the tenants and neighbours are recorded on the plan.